These are the systems owned by the owners, employees, and friends of GHA. Kevin B System: Pioneer 707, Sansui9090, Focal speakers, Yamaha receiver, Nakamichi CD player, Zappa, Zappa, and Zappa. Jake S System: Ariston RD11 with Mission 774 pickup arm and Audio Technica AT15Sa, Naim Nait 3, Rega RS3 speakers. Erik O System: Naim 90/FC/92, Linn LP12/Rega arm, Denon DL103R, Linn/Naim "Linnk" MC phono stage, Chartwell LS3/5 speakers with Naim speaker cable. Dr. Jay's Music Room System: Joule Electra LA-150 MK-I Preamp, Joule Electra OPS-1 MK-III Phono Line Stage, Joule Electra Phono Stage Power Supply, Sonic Frontiers, SFT1 Transport with I2S, Sonic Frontiers Processor 3 DAC, Sonic Frontiers Power Supply, Well-Tempered Turntable with Transparent Audio upgrades, Van den Hul Frog phono cartridge with Hovland Music Groove cartridge cable, Nelson Pass Aleph 0 monoblock amps x 2, Mytek Brooklyn DAC, NAD C446 Digital Media Tuner, Stax Signature Lamba Pro Headphones, Quad ESL-63 Electrostatic speakers on Arcici stands, Electrostatic Bass Traps, Entec L2-F20 Subwoofers, Tice Signature III Power Block conditioner, Cables: Aural Symphonics interconnects and power cords, 100 Amp dedicated service panel. HOLY COW. Peter B System: Sansui AU666 integrated amplifier and Sansui TU666 tuner, Pioneer 707 (J-Corder modified), Spendor S3/5R2 speakers. Parks Audio Lab System: Technics SP-15 turntable with Audio-Technica ATP-12 tonearm & Ortofon MC100 moving coil cart, Budgie SE tube amp (3 watts with EL84s), and a Budgie phono preamp with CM1254 step up transformers. Not shown are the DIY bass reflex two-way speakers using repurposed Infinity SM82 cabs and Dayton drivers. Joe J System; Lenco turntable/The Wand arm, AMG Teatro cart, Zu speakers. Richard J System: VPI Classic/Ortofon 2M Black, Jolida JD-9 phono stage (w/NOS 1962 Mullard tubes), Qsonix music server into PS Audio DirectStream DAC, BSG Qol signal completion stage, Copland DRC-205 Digital correction unit. PrimaLuna Dialogue HP, Usher BE-718 "Tiny Dancer" speakers. Jim S System: ATC SCM-11 speakers, Gig Harbor Audio 24" stands, Rega Elex-R integrated, Rega P3 turntable with Dynavetor 10x5 cartridge. Richard C System: Kenwood KA-7002 (restored). Kenwood KT-7001 9 (restored), ADS L-200s (stock), Kenwood KD-600 customized with Jelco 750E tone arm and vintage Grace F9F cartridge. George M System: Exposure 3010 integrated, Well Tempered Labs Amadeus turntable, Denon DL103R, Sony Hi-Res music player, Graham LS5/9 speakers. Brian S System: Pioneer SX1010 running as pre-amp into Dynaco ST-70, Braun I810s speakers (or Pioneer CS 99a's, or Polk Rti 8's), Project Debut Carbon with acrylic platter. Bob A system: McIntosh MR71/C20, Rega RP6/Elys cartridge, Parasound DAC/Phono, McIntosh MC30 monoblocks, 1976 Klipsche KHorns. 911 Michael System: Cambridge Audio Azur 851E, Cambridge Audio 851W, Monster Power HTS 3600MKII, Focal 1028be, JL Audio F113V2 subs, Shunyata ZTron Pythons, Shunyata ZTron Python XLR. Hinton T System: ADCOM GFT-1A AM-FM Tuner, SAE 2900 Parametric EQ/Preamp, SAE 2200 Power Amplifier, PARA SOUND ZAMP V3 Amplifier, TASCAM CD-355 CD player, THORENS TD 160 MKII turntable, SHURE V15 cartridge, TEAC X-10R Reel to reel, SPENDOR 2P2/3R2 Front Speakers, SPENDOR S3/5R2 Rear Speakers, FUBAR III MKII DAC/Headphone AMP. Sean F System: Marantz 2015 receiver, Rega P1, Rega RX1 speakers/GHA 24 stands, Sonos Connect, Replacements "Pleased to Meet Me." J. Smallman System: Empire 298 turntable with Rega RB 303 tonearm, Dynavector 10x5 cartridge, Dynavector P75 phono pre, Naim NAIT -1, Rega DAC, Sonos Connect, Ryan R610 speakers. Chris C System: Rogue Audio Sphinx hybrid integrated, turntable, Sonos connect, Rega RX1 speakers on GHA stands, custom GHA mahogany table, AudioQuest Nighthawk headphones. Radical. Bob "The Ears" L System: PrimaLuna HP, Harbeth SuperHL5 speakers, Coffman pre/headphone amp. Josh E System: Rega Brio R, Thorens 145, Rega RS1 speakers, custom GHA mahogany table. Todd C System: Yamaha CA-5100, 3 x B&K ST-1400 amplifiers, Monster AVS-2000 voltage stabilizer, Marantz DV-6600, Nakamichi DR-3, SOTA Star Sapphire Series 5 turntable, REGA RB-303 tonearm, Sumiko Virtuoso Boron MCC, Budgie tube phono preamp, X-Box One S, Nvidia Shield, JM Lab (Focal) Mini Utopia’s (front), M&K S-85’s (center), KEF Q70’s (rear), Focal Cub (sub), Samsung 65” 4k. DANG! Don M System: Marantz 2230, Music hall mmf-7 and KEF C3. Sean C System: PrimaLuna Dialogue HP, Chartwell LS3/5 speakers!! Rob W System: Yumi Kanto active speakers on GHA stands, Kanto Sub8 subwoofer. Bluetooth from everywhere! Peter B Office System: Rogue Audio Cronus Magnum, D. Gilespie Saturn turntable/AMG Teatro cartridge, Ryan 610 speakers on GHA stands. The table is made of Tesla motors drive units. Aaron T System: Rogue Audio Sphinx integrated, Rega RX1 speakers, Project turntable. NICE!! Joel T System: Rega P3/Denon DL103R, Lehman Black Cube phono stage, Roksan Caspian, Nakamichi 480, Pioneer SA 8800, Pioneer RG2, Marantz SA8260, Sansui TU717, Vandersteen 2ce. Sweet! Eric system: Decware Torii MKIV (25 wpc. EL34 tubes), AT 120/Ortofon Blue, Marantz CD, SonosConnect, Klipsch speakers, custom GHA wood table! Wow, that is a nice amp. Paul W System: Yamaha, Bose, and a really really nice Thorens/Nagoaka MP110. Ken S System: Hitachi Amp, Linear tracking turntable. M-Perkins System! Pioneer SX 5580 Receiver Black Edition, Harman Kardon Bluetooth, Adcom GFS 6 Speaker Selector, Pioneer PDR W739 CDR RW Player, Pioneer GR - 777 Graphic Equalizer, Pioneer CT - W900R Duel Cassette Player, 1set Of Pioneer HPM 100 Speakers, 2 Sets Pioneer CS- 607 Speakers, 1 Set Pioneer CS-907A Speakers, 1 Set Pioneer CS-603 Speakers (Floor), 2 Technics SL 1300 Turntables. That is sweet. Hashtag: Elephants. Rob T System: PrimaLuna HP integrated, Rega P6, PS Audio Streaming DAC, Spendor D7 speakers, GHA custom table. YES! Todd G system: Advent speakers, Sansui 7077, GHA t-shirt. 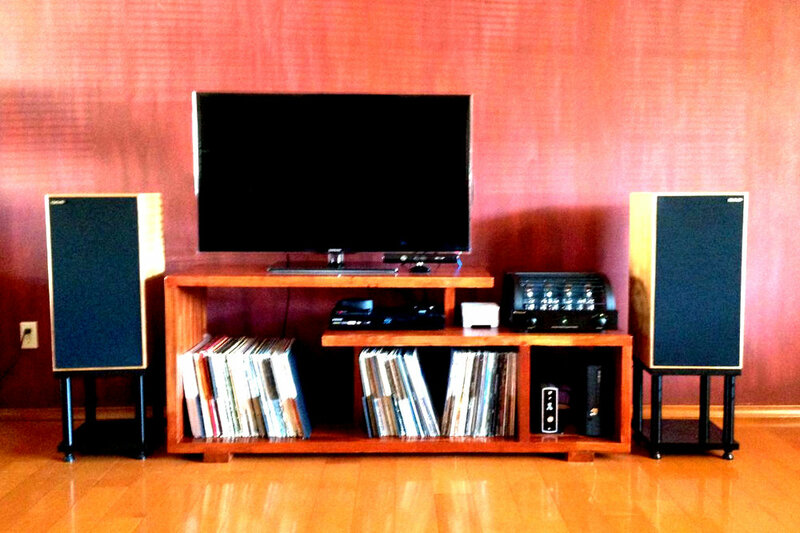 Jason W’s sweet Rega system! Rega Brio, Apollo CD player, P1, RX-1 speakers. Simple, perfect. Quadraspire rack. Patrick C System: PrimaLuna Dialogue Premium, Denon DAC, Harbeth, Sonos Connect, Super HL5s, custom Delrin GHA stands, custom GHA table. Toby P System: Lowther DX-4 drivers in custom Medallion horn cabinets with Rythmik 12 inch down firing subs, Bottlehead Stereomour (1st gen) JJ2A3-40 power tubes, A2900 driver tube, Jupiter HT caps. , Musical Surroundings Nova Phonomena phono stage, VPI Scout IIturntable, Dynavector 20X2L cartridge, DIY interconnects, Cardas crosslink speaker cables. Eric A System: PrimaLuna Dialogue Premium, Linn LP12/Hana SL, Rega DAC, Rega Aria, Rega RX5 speakers. Ed H System: Marantz av8802 f Preamp, Parasound a21, Emotiva XPA-5, Marantz two channel amp, Oppo BDP 105, Panamax power distributor, Shunyata Research Vernon Power distributor, Shunyata Research Zitron Alpha HC Power cords (2) Shunyata Reseach Zitron Anaconda speaker cables, Shunyata Venom HC Power cables(3), Shunyata Research Venom 3 Power cables(3), Shunyata Research Zitron Python interconnects, Klipsch Surround speakers (Front and back) Martin Logan ceiling speakers, Audioquest in wall and ceiling 11 gauge speaker speaker cables for surrounds and in ceiling speakers. Wireworld Silver Electra Power cables (2). Jeff L System: Rega RP3, Rega Brio, Denon DAC, Spendor S3/5R2 (GHA 24 stands). Kailin System: Yamaha AV receiver, ProJect Debut Carbon turntable/Ortofon Red, KEF LS50 speakers, GHA custom speaker stands. Jacob E System: Acurus A200 amp, Hafler preamp, Speaker lab 4s, Wharfdale 22 on GHA stands. Jonathan J System: JBL Harkness C40 speakers, ProJect RPM 5.1 w/speedbox, Belarri VP129 phono stage, Onix SP3, NAD C542 CD, Denon AVR X4200W, Onix SP3s. Jon M System: ITunes via Airport Express through Maverick Audio Tube Magic DAC into Yaqin MC-30L amplifier, Focal 836v speakers. Nice! J and S Fisher System: Kenwood receiver, Silverline speakers, GHA Custom AR-XA/Rega turntable. Sweet! Robert System: Ryan 620 floor standers, Thorens TT, CJ power amps, Akai GX 625 R2R. Hi Voltage Records System: Custom GHA bamboo AR-XA/Rega 303/Denon DL103R, Pioneer 1250 receiver, Project Tube phono stage, JBL speakers. J.P. System: Kappa 7.1 speakers. Harmon Kardan PM-665, Jolida FXIII DAC. SWEET! : Jolida FX10, AudioTechnica LP120, Custom GHA Fostex speakers. Ted System: PrimaLuna Dialogue, Sonos Faber speakers! Troy J System: Left Audio Linear turntable: SME Type II Improved-R VDH MCD-501, Grado G2+. Right Audio Linear turntable: Grace 707 w/NOS DIN cable, 1/4" glass platter, Grado Prestige Gold cartridge. Playing with: McIntosh 712, Oppo 103, McIntosh MC7200, Monster Signature HTPS 7000, Shunyata Antares (Bal) IC, MIT 3 Bi-wired, and Vandersteen 2CI speakers. Wow. Jim D System: NAIM Uniti-serve, Aesthetix Pandora Signature DAC, ARC Ref5se, Ayre VX-R Twenty, Vandersteen 7 mk2 , Audioquest and LFD cables ancillary...Revox B77 hi-speed, Stax cans. 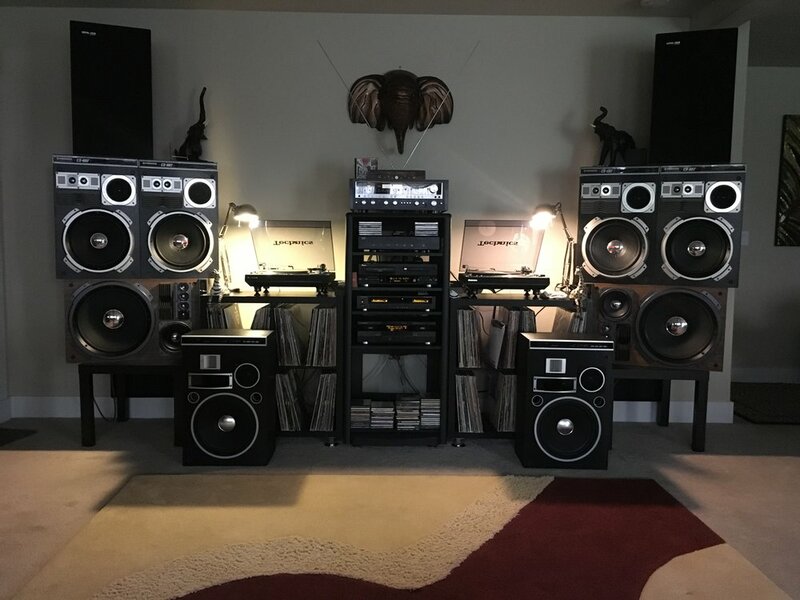 Richard T System: McIntosh MC2155 Bi Amp, Lyngdrof Room Perfect Processor, Mytec Brooklyn DAC W/ External Kecer Dc116 power supply, OPPO 95 player w/ power mods, McIntosh C220 W/ telefunken plate Ecc822 smooth plate tubes, McIntosh MR78 FM Tuner, MusicHall MMf5 w/ Denon “RED” Stylus, Martin Logan Power Sub Woofer W/ Sub Trap, B&W 803D Speakers, Magic Audio Bi-Wire Speaker wire system and Richard Gray Power Supply. Jim H. System: Rogue Stereo 100 Amp, Rogue RP-1 Pre-Amp, Empire Turntable, Cambridge Audio CD Player, Vienna Acoustics Speakers, Klipsh Subwoofer. Martin WH System: Audio Artistry Beethoven Elite speakers, (2) Classe CA-100 amps, (2) Classe CA-150 amps, Audio Artistry Beethoven four way active crossover, Modwright LS 36.5 DB preamp, Modwright PH-150 Phono stage, Modwright Elyse DAC, VPI Classic Signature TT, Yamaha CD-S2000 SACD player, Yamaha T-2 tuner, Nakamichi Dragon Cassette player, Sony TC-880-2 Reel to Reel and Richard Gray 1200C power supply. WOW. Chuck L System: VPI Scoutmaster II with rebuilt Madrigal Carnegie One and Phoenix Eagle PSU. Clearaudio Basic Plus phono stage. Rogue Audio 99 preamp with super magnum upgrade. Twin Odyssey Audio Khartago stereo power amps, one for each set of speakers. Double Large Advents, refoamed and with new crossover caps and resistors. (One pair were my brothers' college dorm room speakers back in the mid-'70s.) Acoustic Zen Matrix Reference interconnects; Chord Company Carnival Silver Screen speaker cables. Radical! M and D system! Kenwood receiver, GHA-ARXA/Ortofon Red, GHA speaker stands, Rega RX1 speakers.